The 1952 Nobel physics laureate Felix Bloch (1905-83) was one of the titans of twentieth-century physics. He laid the fundamentals for the theory of solids and has been called the "father of solid-state physics." His numerous, valuable contributions include the theory of magnetism, measurement of the magnetic moment of the neutron, nuclear magnetic resonance, and the infrared problem in quantum electrodynamics.Statistical mechanics is a crucial subject which explores the understanding of the physical behaviour of many-body systems that create the world around us. Bloch's first-year graduate course at Stanford University was the highlight for several generations of students. Upon his retirement, he worked on a book based on the course. Unfortunately, at the time of his death, the writing was incomplete.This book has been prepared by Professor John Dirk Walecka from Bloch's unfinished masterpiece. It also includes three sets of Bloch's handwritten lecture notes (dating from 1949, 1969 and 1976), and details of lecture notes taken in 1976 by Brian Serot, who gave an invaluable opinion of the course from a student's perspective. 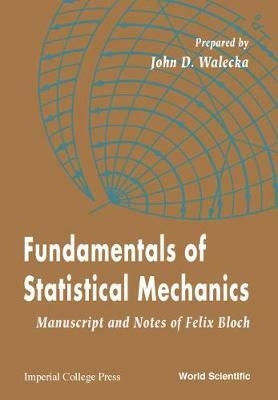 All of Bloch's problem sets, some dating back to 1933, have been included.The book is accessible to anyone in the physical sciences at the advanced undergraduate level or the first-year graduate level.